This dish is healthy, fresh and delicious. Serve it with tortilla chips like a salsa, or serve it in small cups or bowls as a nice salad/appetizer for lunch or dinner. Nice alternative to salsa. The fresh ingredients make it really yummy and healthy too. I would make it with at least a half cup of cilantro...maybe more. But I love cilantro! THis dish was very addictive. I just need to walk away or I might have eaten it all. I might have added a little more avocado and use a generous portion of cilantro. I have a similar recipe that I like which also calls for a little cumin and chili powder and some chopped bell pepper. I also like to use fresh corn when it's in season that I cut off the cob. It doesn't even have to be cooked. A nice refreshing side salad for any type of barbecue. I like it with a lot of cilantro. I love this dish. It is simple yet full of so many great flavors. It works well as a dip or as a taco/burrito filler. This should be a regular item in your weekly menus. Looking to make this salad (w/b-eyed peas) to take to Super Bowl party...where Saints will be victorious! Good recipe. Also known as Southern Caviar, made with blackeyed peas insted of black beans. I've made almost this same recipe for years, the only difference was the salad was then mixed with angel hair pasta as a salad. This is really good and fresh. I make additional dressing and then add a few handfuls of arugula and make it a salad. It's awesome! I have made this recipe many times and every time I do, people beg for the recipe. It is SO good! I made this to much on for the football came today. I did spice it up a bit with the addition of fresh jalapenos and about a tsp of cumin. I used the whole bunch of cilantro and added an extra avocado. This looks very good and easy. I am always looking for something new and different. Just my tastes, but would leave out the cilantro, and maybe add fresh parsley or mint. Really tasty and great with tortillas, chicked a side dish at your bbq. I added cumin and cayanne pepper as i like it hot! I also used black eyed beans and haricot instead of black/kidney? beans. We took this camping as a side dish. It was delicious and fresh after a long day of the flavors mixing in the cooler. The other campers were envious of our prize dish. I added a jalapeno or two, and reduced the amount of salt. I agree with the reviews and would add an additional avocado or two. It is extremely difficult to stop eating this! This is absolutely wonderful for the summer! Love me some cowboy caviar! thanks for sharing! 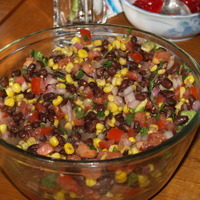 I make this all the time, so funny to me that instead we call it "Mexican Caviar". The only real difference that I can tell it that my version has tobasco suace, and I use green onions and chives instead of red onions. It's definitely a hit. This is very good. Use Fresh Corn when possible. for Tomatoes, do not use Steak tomatoes as they are too watery. Try Roma or better yet use grape or cherry tomatoes cut in half. This is reeeally good. My non adventurous friends even loved it, so fresh and healthy and the avocado is better chunked than the guacamole i used to love. Love it! I make it again and again. I usually do use 2 avocados though. A friend brought this recently to us as a salad and it was devoured. Incredible, especially the next day. Easy to make, goes great as a side dish or dip and believe it or not - on scrambled eggs! My brother topped his with sour cream and stir it up - creamy. Just make it and love it. I really love this recipe. I used a more avocado and cilantro and added some chopped green onion along with a little red onion. same with greek salad...i will probably try this. I love all of the ingredients in this recipe. It's healthy and clean. I would definitely make this. Made this on the weekend and it was great. Next time I will omit the avocado. Found it got mushy in the leftovers. Really good! Cut the recipe In half, kept the full avocado, cilantro and dressing. Served it with Tostitos scoops. Success! A definite keeper. 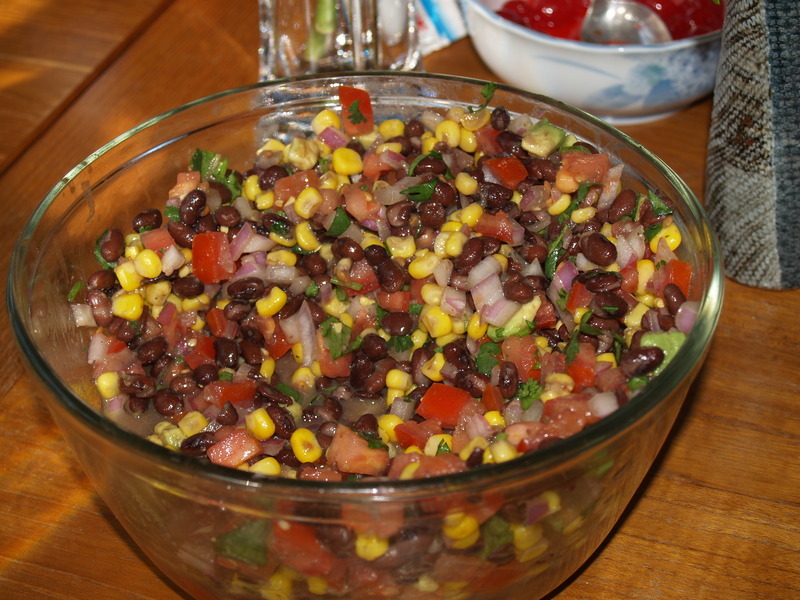 Being a full-blooded Texan, I have known this as "Texas Caviar" and just love it. Thanks for the post - and I agree, there can never be such a thing as "too much cilantro" in this. :) The only change I would make is to say watch the salt, though this one doesn't have a ton of it. So much of the prepped or canned food already has salt in it. I found this even better than traditional salsa, and I don't like beans at all. A great way to get them into your diet. Amazing flavour. wow i love caviar i really like it.thanks for sharing. Wow! This dish is great! I'm so glad everyone's been enjoying this dish. It's always been a hit when I've served it, and like Bon's comment below, it's really versatile. Easy, quick, and wonderful! I made this dish on Friday evening to take to the church on Saturday for a choir party. Everyone raved about it and asked how to make it. The recipe is simple enough that I was able to recall it on the spot. Sunday morning topped my scrambled eggs with the mixture, and rolled up in a tortilla. What a great way to start the day. Monday morning I had just crumbs and small pieces of the dip chips. Using the old ' the crumbs of chocolate cookies are the best' rule (where you place the crumbs in a bowl and add milk), I dumbed the chips in a bowl, dished the salsa over it, added a dab of sour cream, and wah-la - you have the breakfast of champions! Making another big bowl tonight to have for the week. Thanks for the best snack recipe in a long time! Looks and sounds really good, would be great for a side dish. Made this dish for a work dinner. D idnt have any left over. Everyone loved it. Yum! I make a similar dish but without the avocado. A nice refreshing side salad for any type of barbecue. Sounds really delicious and healthy except for the high sodium. I would adjust the salt for a healthier version of the same. This looks lovely, quite similar to a salad a made for dinner last night! Sounds like this is as delicious as it looks -- am planning to take this to a party to share with a crowd! Love the title -- thanks for sharing! Spooky Ghost Cake Pops and a Better Baking Boutique!